The human body is amazing in its ability to protect itself from repeated pressure and stress. It is this adaptive tendency that creates hyperkeratotic tissue (corns and calluses) on the feet. Corns and calluses are thick patches of skin that develop when the foot is subjected to excessive friction and pressure. 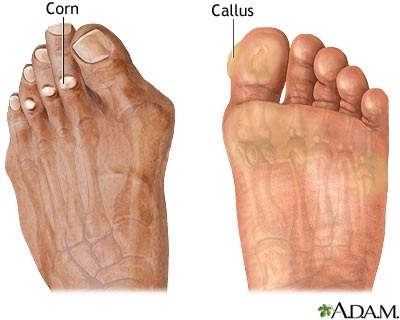 Corns are located on and in between the toes, whereas calluses commonly located on the bottoms and sides of the feet. The skin forms a protective layer over the foot to make it less vulnerable to injury. However, the corns and calluses may eventually become a problem if not properly managed. Often calluses are found on those who may spend a lot of time walking barefoot outdoors. Corns and calluses can also form to compensate for improper foot alignment. They can become exceedingly rough and dry and in some cases the callus may start to crack. While smaller calluses may be unsightly, it is the rough and cracked skin that may become painful. Corns and calluses can be easily managed with a daily routine of exfoliation and moisturizing. There are many products available to make foot care easier, such as foot soaks, pumice stones and files. For those with severe or recurring problems, the occasional pedicure may be in order. Of course prevention is always the most effective form of treatment, so if you are experiencing corns and calluses, take care to protect your feet and adjust your posture so your weight is distributed evenly across the entire foot. Contact us today to learn more about calluses and what you can do to manage them.